Virtual reality film footage is created as a bubble of moving images that you can immerse yourself in by putting on a virtual reality headset. The realistic experience is said to be the new age of film technology where the viewer’s eyes can wander to feel as if they are within the film itself. This could be the future of cinema meaning that a big screen viewing could soon become a thing of the past. People are becoming hungry for deeper experiences as the film and TV industries expand and advance. The footage works with a smartphone with motion sensors calculating the angle of the viewers gaze as they move their head. The smartphone screen which is attached to your head allows you to watch the movie scene from all points of view. With high resolution screens and effective sound systems, the technology is proving to be a lot more intimate than the large 3D screen. Although the technology is not quite perfected yet, it is already at a standard to make large profits and its capabilities are endless. Scenes from a recent shooting for ‘Jesus VR’ are the first feature-length film clips which were shown at the Venice Film Festival. The film was shot in the city of Matera in Italy which is a typical biblical setting for the location. Producer, Alex Barder spoke to the film festival audience about his aims and reasoning’s behind his plans. With a variety of people from different backgrounds and occupations, it was interesting for Barder to observe the initial impact and emotions on the audience faces when watching the clips for the first time. The virtual reality experience works by placing all film cameras on set in every direction of focus. This enables the viewer to view the scene from every perspective without flaws in resolution or jolting scenes. It is a precise and difficult process to produce 4K resolution clips and smartphone screens do display magnified pixels which do not make it the best to view so close to your face. However, compared to HD televisions, the new technology is a strong contender in terms of its quality and abilities. Almost every production company across the world is now pondering what the capabilities are for this new technology. Some fear that there will only be a small number of people who will actually get a VR headset. On the other hand, there are billions of smartphone users in the world which could be an effective targeting market in the modern world. We have seen the recent 360° videos on YouTube and Facebook and virtual reality apps which have changed the way we immerse ourselves within scenes. 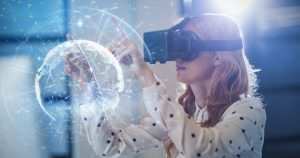 With technology dramatically advancing in the field of 3D virtual reality, feature-length clips could have a large impact on not only the film industry, but also TV and gaming industries. Virtual reality boss, Herman Narula explains ‘We read books and we cry, we laugh, we’re horrified, we fall in love- those experiences matter to people. Online worlds need to evoke the same thing’. Virtual reality technology tells a story to an audience in a completely different way with the aim of submerging and engrossing viewers. It creates a world with a complex system of physical laws in order to give a lasting impression on the viewer, as the purpose of a storyline does. The original ‘shot and cut’ process of cinema are no longer as effective as they used to be and audiences are wanting a new dimension of visual freedom. Virtual reality has the capability to transform the user experiences of film.